Halaman ini memuat daftar penghargaan dan nominasi yang diterima oleh Billy Ray Cyrus. ^ a b "Billy Ray Cyrus - CMA Awards". CMA Awards. Diakses tanggal June 20, 2011. ^ "1992 Billboard Music Awards". The Baltimore Sun. December 10, 1992. Diakses tanggal June 26, 2011. ^ a b "Music Video's Leading Lights In B'board Spotlight, page 39". Billboard Magazine. November 28, 1992. Diakses tanggal June 25, 2011. 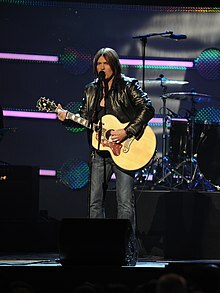 ^ a b c d e f g h i j k l m n o p q r s "Spotlight on Billy Ray Cyrus". Country Music Library. Diakses tanggal March 26, 2011. ^ "Walkway of Stars". Country Music Hall of Fame. Diakses tanggal June 20, 2011. ^ a b "JUNO Awards". Junoawards.ca. Diakses tanggal June 20, 2011. ^ a b "The American Music Awards nominees set". Allegheny Times. December 16, 1992. Diakses tanggal June 20, 2011. ^ a b "Billy Ray Cyrus named top new country artist". Daily Times. January 26, 1993. Diakses tanggal June 26, 2011. ^ "American Music Awards 1994". Rockonthenet.com. February 7, 1994. Diakses tanggal June 20, 2011. ^ a b c d e f "ACM Awards". Acmcountry.com. Diakses tanggal June 20, 2011. ^ 1993 World Music Awards. Variety. June 2, 1993. Diakses tanggal June 25, 2011. ^ "Canadian Country Music Association Awards Awards". CCMA. Diakses tanggal June 24, 2011. ^ a b c "The 1993 Grammy Awards: Hot acts and cool music". The Item. February 19, 1993. Diakses tanggal June 26, 2011. ^ "Grammy Awards 1994". Rockonthenet.com. March 1, 1994. Diakses tanggal June 20, 2011. ^ "The Congressional Medal of Honor Society's National PATRIOTS AWARD". Home of Heroes. Diakses tanggal June 24, 2011. ^ "Artist Humanitarian Awards". Country Radio Broadcasters. Diakses tanggal June 24, 2011. ^ "Proceedings of the 97th National Convention of the Veterans of Foreign Wars of the United States, page 47" (PDF). U.S. Government Printing Office. August 19, 1996. Diakses tanggal June 24, 2011. ^ a b c "Brooks, Gill, Strait top TNN nominees". Record-Journal. February 3, 1993. Diakses tanggal June 25, 2011. ^ a b c d Kate Haggerty (June 14, 1997). "The Stars Come Out Monday Night at The TNN Music City News Country Awards". CMT.com. Diakses tanggal June 20, 2011. ^ "CNN - The winners of the 31st TNN/Music City News Awards". CNN. Diakses tanggal March 26, 2011. ^ a b c d e f Kimmy Wix (June 15, 1998). "Give Billy Ray A High Five and Neal McCoy One He'll Never Forget!". Cmt.com. Diakses tanggal June 20, 2011. ^ "Billy Ray Cyrus booking". Delafont.com. Diakses tanggal June 20, 2011. ^ a b "Some Billy Ray Cyrus nominations & awards". The Envelope. Diakses tanggal June 21, 2011. ^ "Billy Ray Cyrus - Awards". Internet Movie Database. Diakses tanggal March 26, 2011. ^ "MOVIEGUIDE Awards: The Grace Awards". MovieGuide Awards. Diakses tanggal March 26, 2011. ^ "Billy Ray Cyrus nominee in CMT Awards". CMT.com. Diakses tanggal June 20, 2011. ^ "2010 Teen Choice Awards". Metro Lyrics. Diakses tanggal March 26, 2011. ^ "GMC Music Video Awards Sat. Jan. 2 at 7:00 PM (ET)". ChristianNewsWire. Diakses tanggal June 26, 2011. ^ "30th Annual Golden Raspberry (Razzie®) Award "Winners"". Razzies. Diakses tanggal June 26, 2011. ^ "18th Annual American Society of Young Musicians Benefit Concert and Awards". Century City News. Diakses tanggal March 26, 2011. Halaman ini terakhir diubah pada 23 Januari 2017, pukul 23.11.